Sub-Lt. Uchechukwu Erege deploys a conductivity-temperature-depth cast to obtain sound speed. This fall, NOAA Ship Thomas Jefferson has had the pleasure of hosting Sub-Lieutenant Uchechukwu Erege. Sub-Lieutenant Erege, known to the ship’s crew as “UK,” is a hydrographer in the Nigerian Navy Hydrographic Office. The Nigerian Navy Hydrographic Office is the national hydrographic authority for the country and is responsible for conducting hydrographic surveys in territorial waters, ensuring nautical charts are up-to-date, processing bathymetric data, and providing Notice to Mariners for hazards to navigation. UK joined the Nigerian Navy in 2012 after graduating with distinction from the University of Lagos with a bachelor’s and master’s degree in geoinformatics. He then completed a 10-month training program at the Nigerian Defense Academy before transitioning to his current position in the hydrography branch. The United States and Nigeria are both member States of the International Hydrographic Organization (IHO), whose primary aim is to ensure the world’s oceans and navigable waterways are surveyed and charted. Through a grant funded by IHO and the government of South Korea, members of developing countries are able to attain higher education in the field of hydrography. UK was awarded this grant in 2014 and used it to attend the University of Mississippi’s 12-month master’s program in hydrographic science. During his time at the University of Mississippi, a professor put him in contact with Captain Shep Smith, commanding officer of NOAA Ship Thomas Jefferson. Through a recommendation from the Nigerian Chief of Naval Staff and Capt. Smith, UK augmented for three months on Thomas Jefferson. While on Thomas Jefferson, UK gained hands-on experience as a sheet project manager, and in ship and hydrographic survey launch acquisition of multibeam and side scan sonar data, conductivity-temperature-depth casts, system integration, and troubleshooting. UK proposes creating standard operating procedures in his office, for processing efficiency. An SOP for public affairs can also help inform the country of hydrographic survey projects. UK would also like to recommend more collaboration with international agencies, such as NOAA, and with Nigeria’s West African neighbors in regards to hydrography. Ensign Peter Gleichauf presents Sub-Lt. Uchechukwu Erege with the NOAA Corps flag that Thomas Jefferson sailed with during his time augmenting on the ship. The entire crew signed the flag. Sub-Lieutenant Uchechukwu Erege has been a valuable asset to the Thomas Jefferson crew and we wish him the best of luck in his future endeavors. Fair winds and following seas! From 2005 through today, NOAA Ship Thomas Jefferson has been surveying Long Island Sound, one project area at a time. Some of the area was last surveyed between the late 1800s and 1939. For the 2014 field season, Thomas Jefferson was assigned her final Long Island Sound project, 89 square nautical miles of Eastern Long Island Sound, Fisher Island Sound, and Western Block Island Sound. When this project is complete, we will have resurveyed over 95% of Long Island Sound and all of Block Island Sound with modern survey technology that allows for a complete picture of the seafloor and highly accurate soundings. This image depicts Thomas Jefferson‘s bathymetry from eastern Long Island Sound to Gardiner’s Bay. Data acquired by the Thomas Jefferson will update the region’s nautical charts and will serve other users within NOAA, the U.S. Geological Survey, and a New York and Connecticut Long Island Sound Seafloor mapping initiative. The mapping initiative creates products for habitat mapping and geological interpretation, and supports state planning and management of this vital resource. Bringing the hydrography of this area into modern times has been a huge task, and we appreciate being welcomed as a part of the area’s maritime community! When Thomas Jefferson was asked to participate in the Connecticut Maritime Heritage Festival in New London this summer, the crew was excited for the opportunity to showcase the results of nearly a decade of surveying effort. On September 12, Thomas Jefferson docked at City Pier, dressed in semaphore flags to welcome crowds lining the pier eager for guided tours. As the sun set, Thomas Jefferson hosted judges and the announcer during the festival’s lighted boat parade. The ship continued to provide tours the next day, and was the highlight of the event for many visitors. More than 500 visitors toured from fantail to bridge, learning about the ship’s mission and hydrographic survey operations, life at sea, and maritime heritage of NOAA and the Office of Coast Survey. As the festival ended, Thomas Jefferson’s crew cast off from City Pier to return to their Long Island Sound working grounds and continue survey operations. 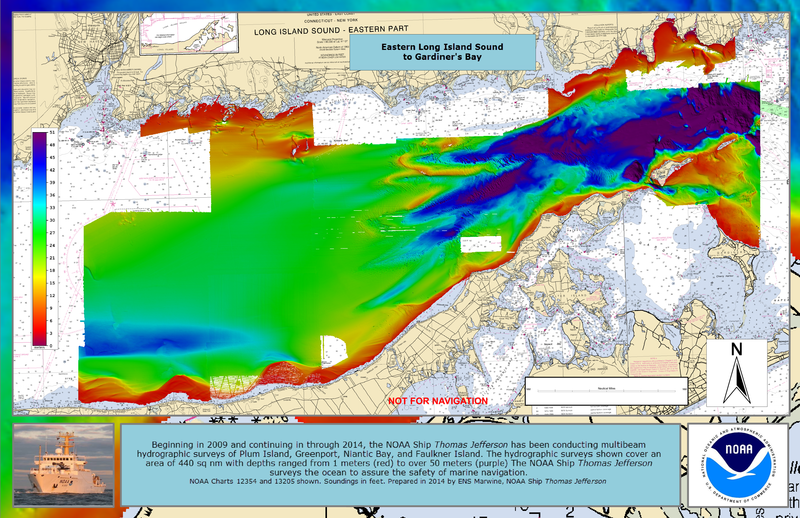 We are excited to return to the survey area and complete the 2014 Long Island Sound mapping project. 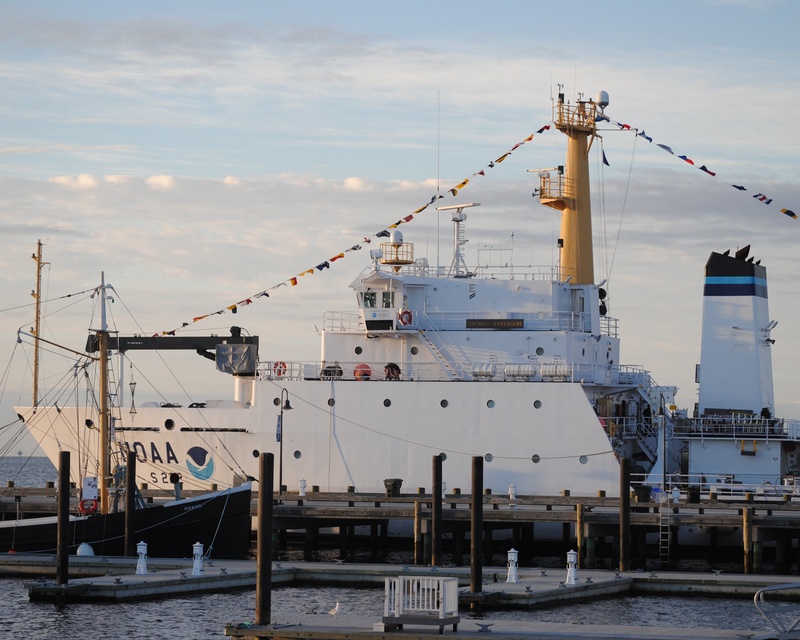 NOAA Ship Thomas Jefferson dressed in semaphore flags for Connecticut’s 2014 Maritime Heritage Festival. Photo by Lt. Cmdr. Abigail Winz. Cmdr. 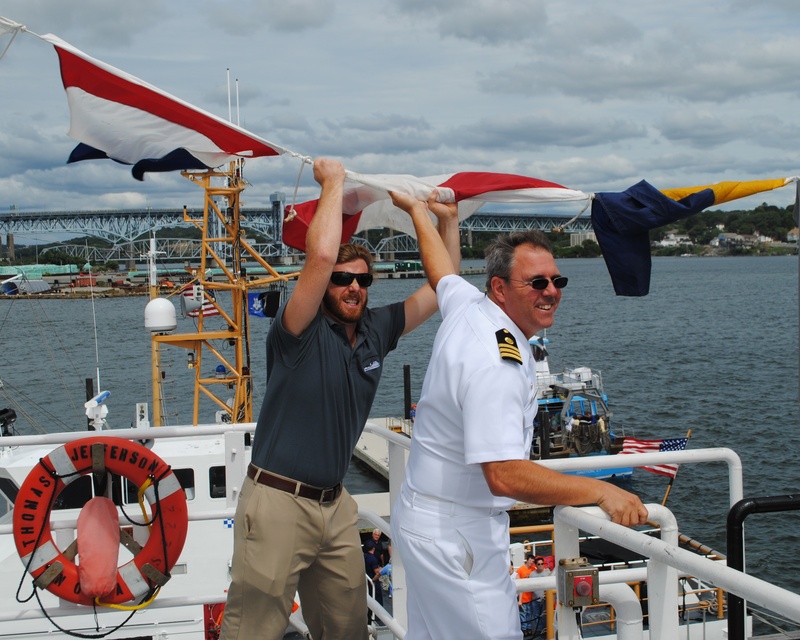 James Crocker and hydrographic assistant survey technician Alex Ligon wrestle with wayward semaphore flags to keep NOAA Ship Thomas Jefferson looking her best for Connecticut’s 2014 Maritime Heritage Festival. Photo by Lt. Cmdr. Abigail Winz. 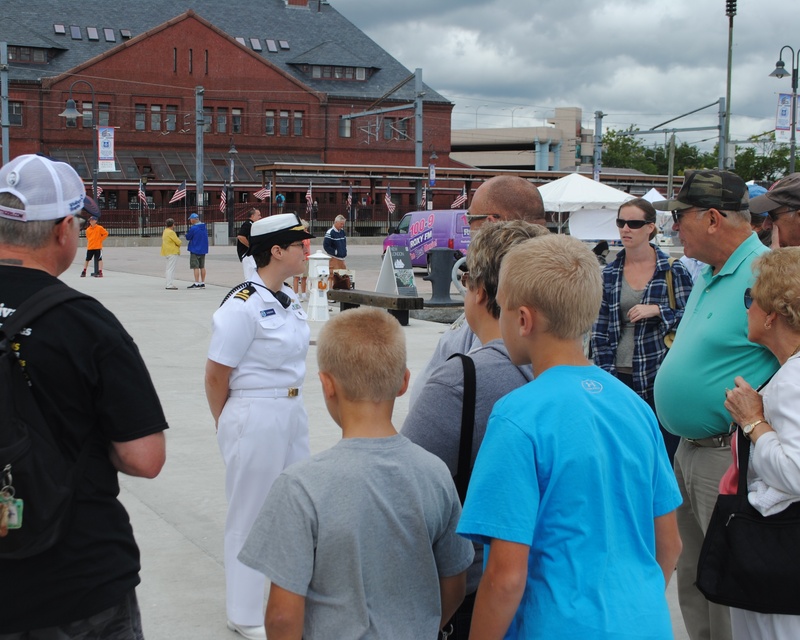 Lt. Megan Guberski greets a tour group about to board NOAA Ship Thomas Jefferson during Connecticut’s 2014 Maritime Heritage Festival. American flags patriotically line New London train station in the background for the special event. Photo by Lt. Cmdr. Abigail Winz. 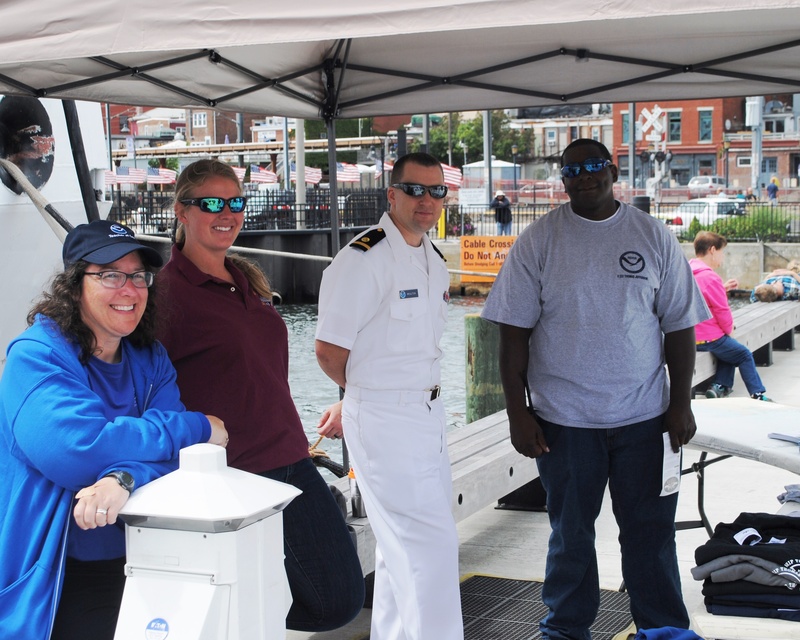 From left to right, “Teacher at Sea” Dr. Laura Guertin, hydrographic survey technician Allison Stone, Ensign Stephen Moulton, and general vessel assistant James Johnson dedicated their time to spreading the word about NOAA’s hydrographic mission. The 2014 hydrographic survey season is underway, with the NOAA fleet beginning its projects for this year. Have you ever wondered how Coast Survey goes about determining where to survey and when? Several considerations go into prioritizing survey plans, which are laid out several years in advance. Coast Survey asks specific questions about each potential survey area. Is it considered a critical area? If so, how old are the most current survey data? Have local pilots or port authorities submitted reports of shoaling, obstructions or other concerns? Does the U.S. Coast Guard or other stakeholders from the maritime community (e.g., fisheries, energy, pipelines) need surveys for economic development or ecological protection? 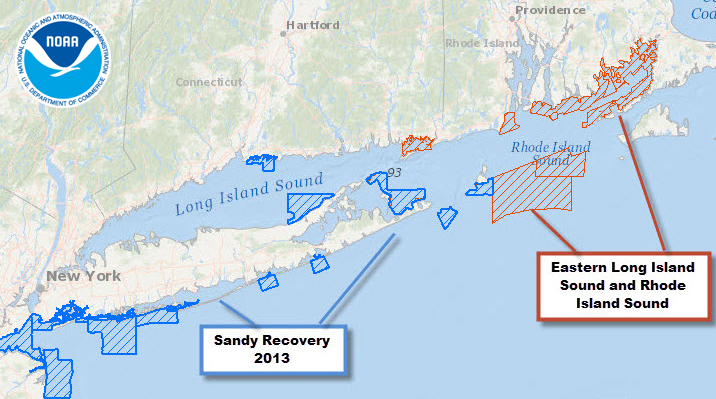 Coast Survey’s 2014 projects reflect these priorities. 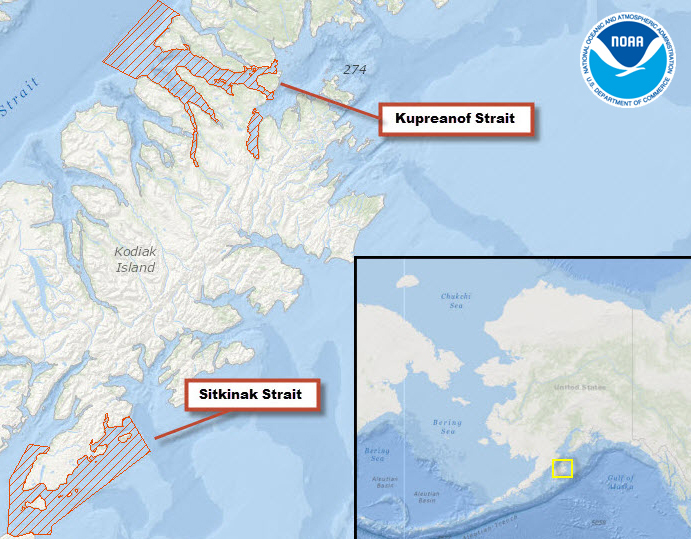 NOAA Ships Rainier and Fairweather will be surveying Kodiak Island, specifically Kupreanof Strait to the north and Sitinak Strait to the south. These are considered emerging critical areas, because of both old soundings (1900-1939 for North and 1900-1969 for South Kodiak Island) and increased demand from the tourism and commercial fishing industries to chart safe passages closer to shore. 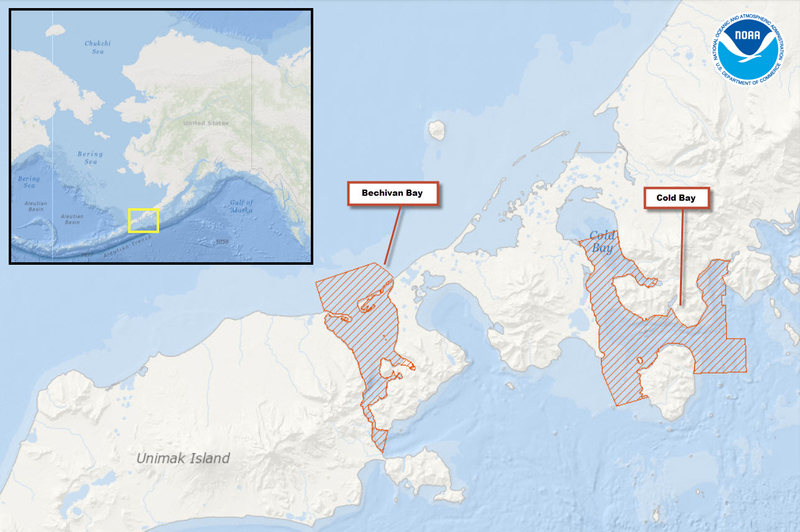 One of NOAA’s hydrographic services contractors will survey Bechevin Bay, a priority area because it constitutes the easternmost passage through the Aleutians from the Bering Sea to the Gulf of Alaska. In addition, hydrographic surveys in this area will help validate an algorithm, being tested by NOAA’s Remote Sensing Division, that estimates water depth strictly from satellite imagery. Fairweather will survey south of the San Juan Islands, in the Straits of Juan de Fuca in Washington. The team will also investigate reported shoaling in Friday Harbor. One of Coast Survey’s navigation response teams, NRT6, is surveying in San Francisco Bay, where the San Francisco Bay Pilot Association requested surveys in San Pablo Bay and Suisun Bay at the Reserve Fleet area, and in Richmond Harbor to address charting discrepancies and other concerns. The ship will then survey Anchorages 22 and 23 (Carquinez Strait, near Benicia, CA) to chart a shoal that has migrated toward the federal channel and caused a tug and barge to run aground. Pilots and port authorities requested hydrographic surveys in Galveston Bay and the vicinity, and NRT4 is responding. Anchorages in this area are of particular interest; the team will survey Anchorage Basin A in Bolivar Roads and the newly charted barge channels and charted features along the main Houston Ship Channel. A NOAA contractor will survey in Louisiana, offshore of Barataria Bay. About 5,000 deep-draft vessels transit the Southwest Pass of the Mississippi River per year. Surveys will be looking for turnoffs and turning basins for large vessels. A re-survey of sandy, changeable bottoms in the areas of Mobile Bay, Alabama, and Panama City, Florida, will also be conducted to finish surveying approach lanes to these ports. 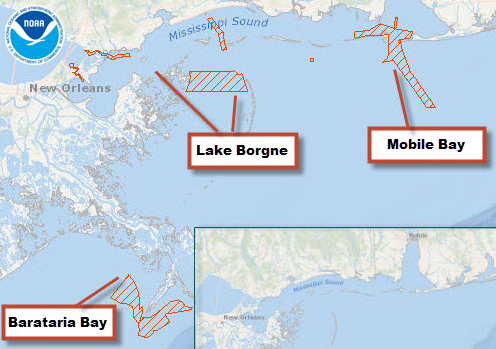 A NOAA contractor will survey the approaches to Lake Borgne/Lake Ponchartrain in Louisiana, where charts still use data acquired by the U.S. Coast Survey in the 1800s. NRT1 is surveying in Panama City, Florida, acquiring data in St. Andrews Bay and West Bay. The team will also investigate shoaling and a changing channel course in Grand Lagoon, depths and features in West Bay and West Bay Creek, and depths along the Gulf Intracoastal Waterway. After they finish up in Florida, NRT1 will continue the rest of the 2014 survey season in Louisiana. NRT2 will survey in the St. Johns River area near Jacksonville, Florida, in response to a request for support from the U.S. Coast Guard. The survey team will investigate hazards to navigation in the waters of a proposed anchorage area seven nautical miles northeast of St. Johns Point. NRT5 will survey in the area of Eastern Long Island Sound. Along with providing contemporary hydrographic data, this survey will support the Long Island Sound Seafloor Mapping Initiative. NOAA Ship Thomas Jefferson will also survey in Long Island Sound, performing essential habitat mapping in Fishers Island Sound, and continuing Post Tropical Cyclone Sandy surveys that were started in 2013. In central Chesapeake Bay, the research vessel Bay Hydro II will survey critical areas, measuring depths where shifting sands and shoaling have been reported. NOAA Ship Ferdinand R. Hassler will survey a possible wind turbine site in the approaches to the Bay. The Hassler will survey off the coast of Portsmouth, New Hampshire. This data will contribute to habitat mapping and the state’s effort to locate sand resources for beach replenishment. Finally, the Thomas Jefferson and Hassler will survey an area offshore of Rhode Island Sound to identify a safe route for deep draft oil tankers. The area is also a potential site for wind turbines. Today, June 21, is World Hydrography Day. Hydrographic offices in over 80 maritime nations observe this day every year, since 2005. It is our special day to tell the public what hydrography is, and how it is employed to make navigation safer. Simply, hydrography is the science we use to obtain the data needed to create nautical charts. NOAA’s 200-year history is proof positive that those charts – and therefore hydrography – are a national investment that pays off daily with navigation safety, efficiency, and coastal protection from accidents at sea. But today’s observation of World Hydrography Day is more profound. 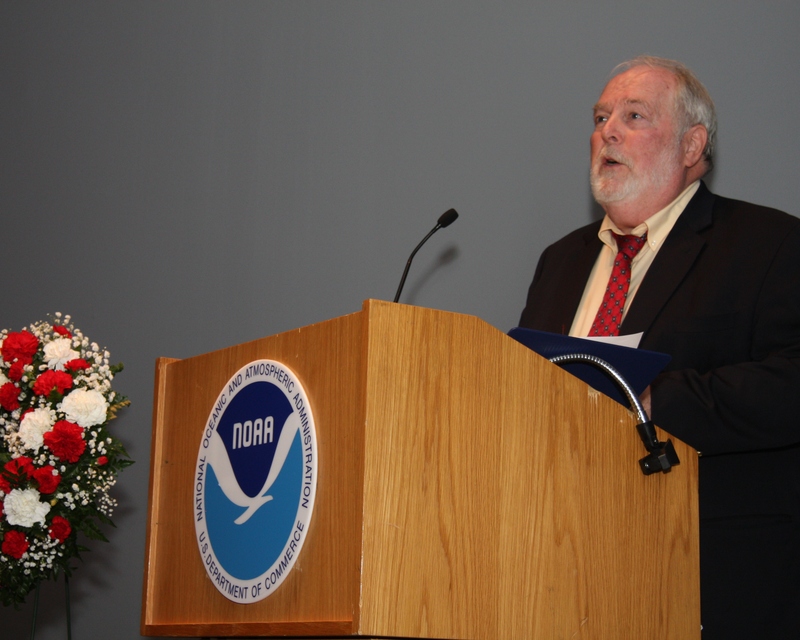 It is personal to every person who works in or supports hydrography in the United States. It was 153 years ago, to the day, that the U.S. Coast Survey experienced the largest single loss of life in our history. In the early morning hours of June 21, 1860, on stormy seas, the U.S. Coast Survey Steamer Robert J. Walker was hit by a commercial schooner when she was transiting from Norfolk to their homeport in New York, after surveying in the Gulf of Mexico. The ship sank quickly, and twenty crew members died. Another man died from his injuries the next day. In 1852, W.A.K. 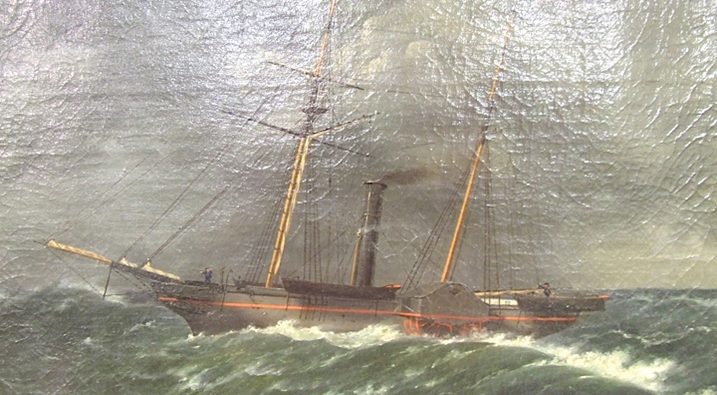 Martin painted this picture of the Robert J. Walker. It is now at the Mariner’s Museum in Newport News, Virginia. Today, we honored the lost crew members of the Robert J. Walker for their service to the nation. The NOAA Ship Thomas Jefferson is currently working near where the Walker sank. They are taking a couple of hours to survey the area, with multibeam and sidescan sonar, as part of a NOAA Maritime Heritage effort to pinpoint the exact location and confirm the identity of the Walker wreck. (While NOAA nautical charts show a seafloor obstruction, we have not positively identified the Walker.) 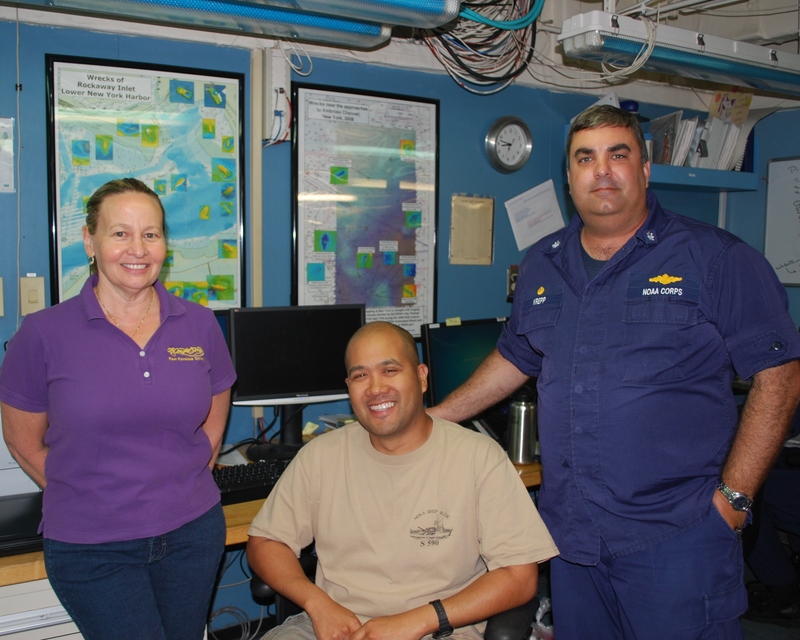 For the survey, Thomas Jefferson commanding officer Larry Krepp welcomed two “wreck experts” on board: Joyce Steinmetz, a nautical archaeology and maritime history expert from East Carolina University, and Vitad Pradith, the technical director with Coast Survey’s Navigation Response Branch. Joyce Steinmetz, Vitad Pradith, and Cmdr. Lawrence Krepp on board the NOAA Ship Thomas Jefferson, as they departed on the survey leg that included a search for the wreck of the Robert J. Walker. 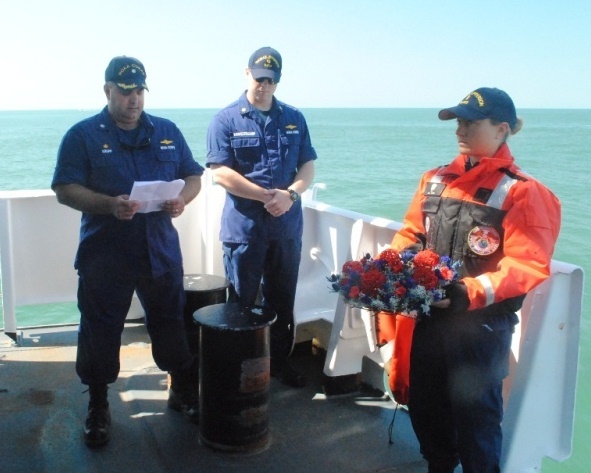 Honoring the memory of the 20 USCS crew members who perished the morning of June 21, 1860, the Thomas Jefferson’s newest hydrographer, Ensign Eileen Pye, laid a memorial wreath on the waters above the sunken wreck of the U.S. Coast Survey Steamer Robert J. Walker. Cmdr. Larry Krepp, Lt. Cmdr. Chris van Westendorp, and Ensign Eileen Pye during the honor ceremony onboard the NOAA Ship Thomas Jefferson. Ensign Eileen Pye, the Thomas Jefferson’s newest hydrographer, lays the wreath over the waters where the USCS Robert J. Walker sank. 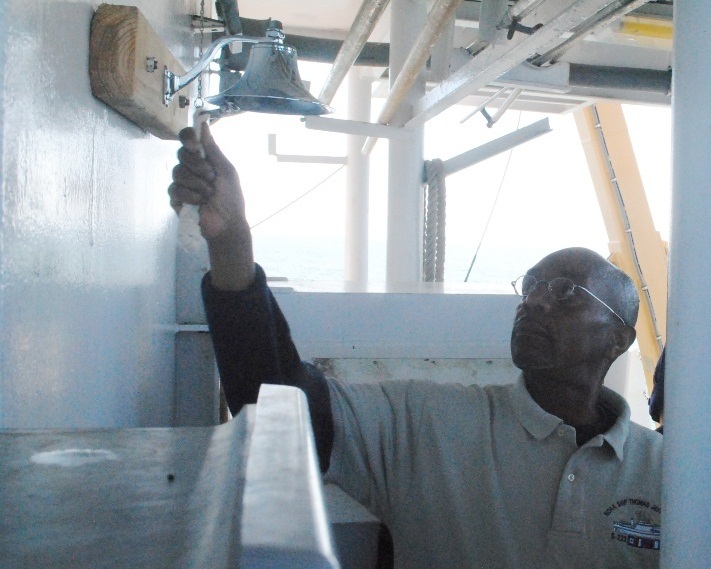 Seaman surveyor Anthony Teele rings the Thomas Jefferson ship’s bell, honoring the Walker crew. 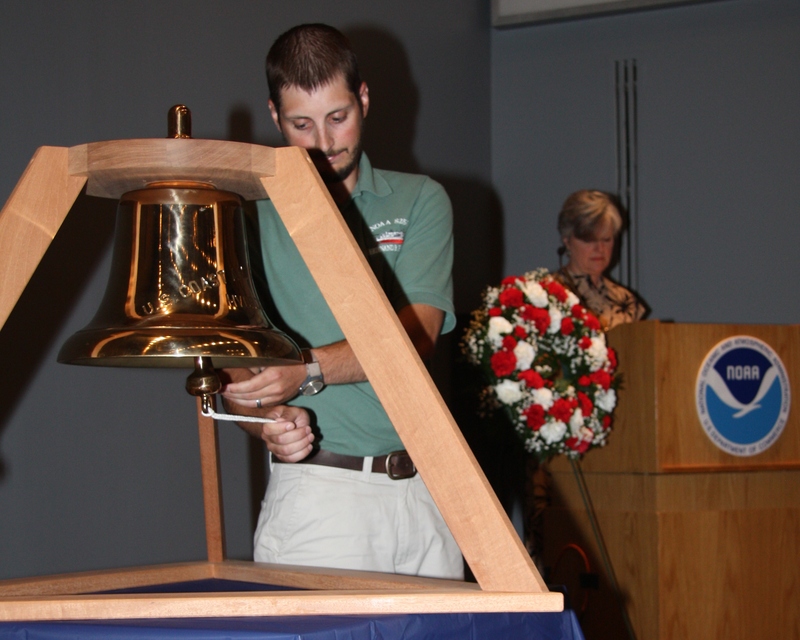 David Moehl, a senior survey technician on the NOAA Ship Ferdinand R. Hassler, rang an historic hydrographer’s bell, once for every man who died that day, as Cheryl Oliver, the president of the U.S. Coast and Geodetic Survey Historical Society, read each man’s name. 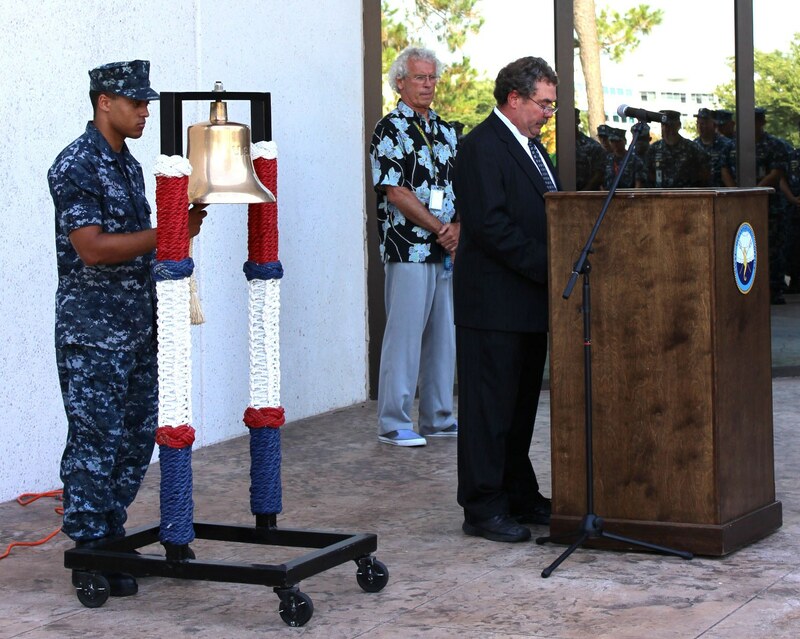 Senior survey technician David Moehl rang an historic ship’s bell as Cheryl Oliver reads the name of each Robert J. Walker crew member who died. Rear Adm. Michael Devany noted that the crew of the Walker would be honored to know that their work continues today. Two other federal programs are also involved in the nation’s hydrography. We were very pleased that representatives from the National Geospatial-Intelligence Agency attended the NOAA event. In a show of solidarity, the hydrographic office of the U.S. Navy held their own simultaneous ceremony at their location in Stennis, Miss. 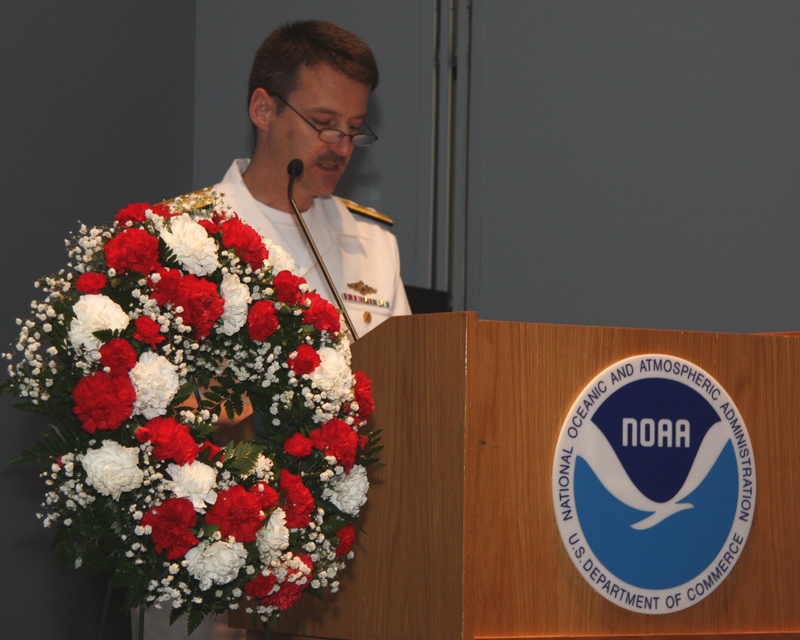 The Naval Oceanographic Office joined NOAA in honoring the Walker crew on World Hydrography Day. AGAA Jahmal Moore, Steven Harrison, NAVOCEANO Hydrographic Department Director, and Michael Jeffries, technical director of the Fleet Survey Team, lead the ceremonies. 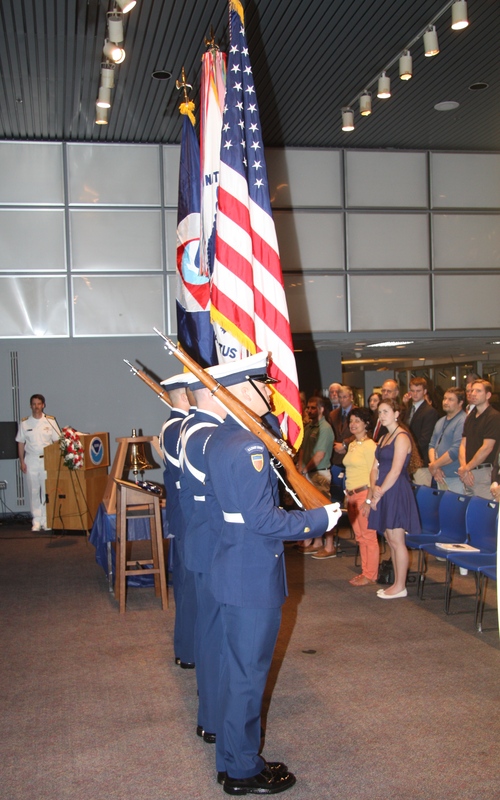 In honor of the strong ties — historical and contemporary — between NOAA and the Coast Guard, a USCG Honor Guard proudly posted and retired the colors for the ceremony. Back in 1860, the U.S. Coast Survey never published the names of the lost crew members. However, the New York Times, on June 23, 1860, wrote about the accident and published this list. Marcus (or Marquis) Buoneventa, ward-room steward. George W. Johnson, son of Mr. Johnson, the actor. John M. Brown, captain of after guard. For more information, see nauticalcharts.noaa.gov/RobertJWalker. 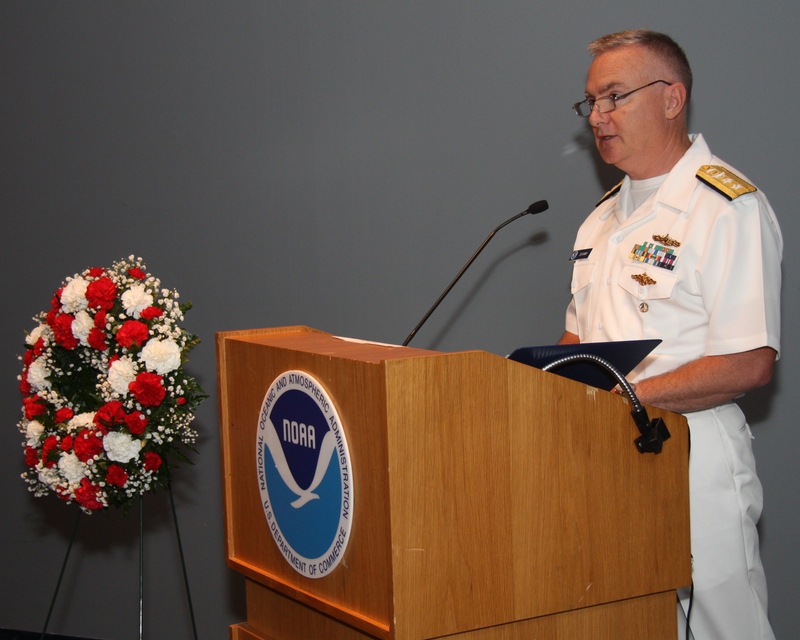 Also, listen to this recent National Ocean Service podcast interview of Rear Admiral Glang. There’s a fascinating story behind (literally) the painting of the Walker. See A Good Story, from the Mariners Museum blog. 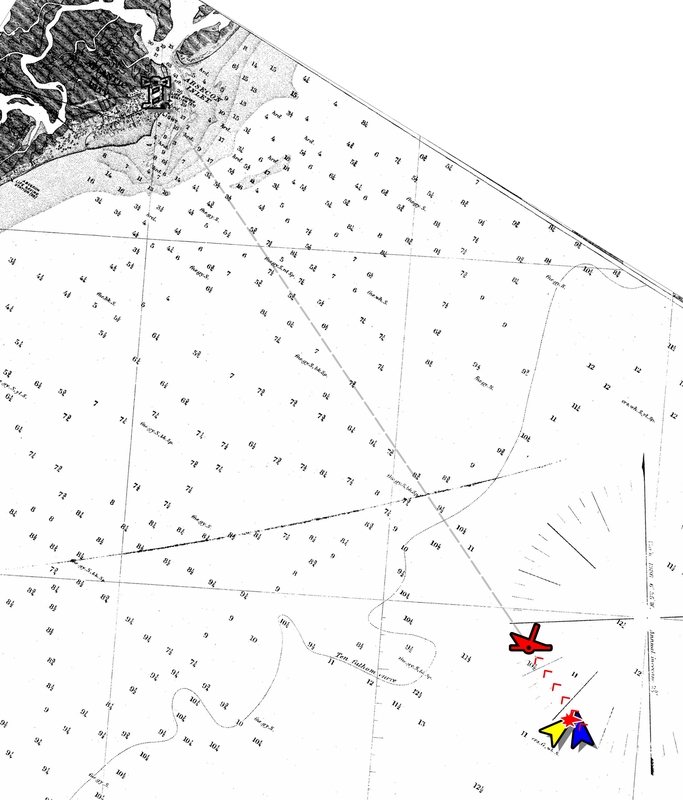 The site of the collision and location of the wreck is plotted on this nautical chart from 1852. For more information, see the National Marine Sanctuaries report, Rediscovering the Walker. Listen to a podcast from two of the experts who found the Walker. 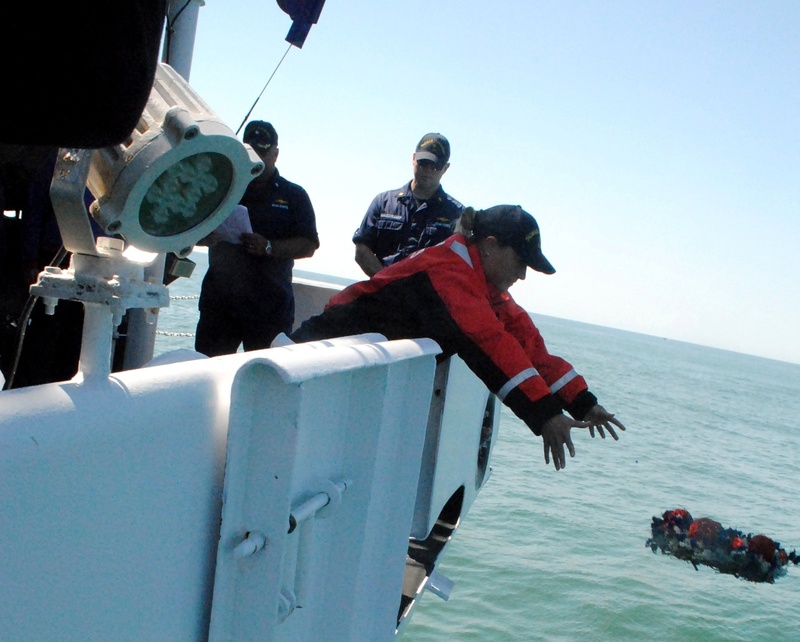 See video of what the divers found, on Finding the Robert J. Walker.